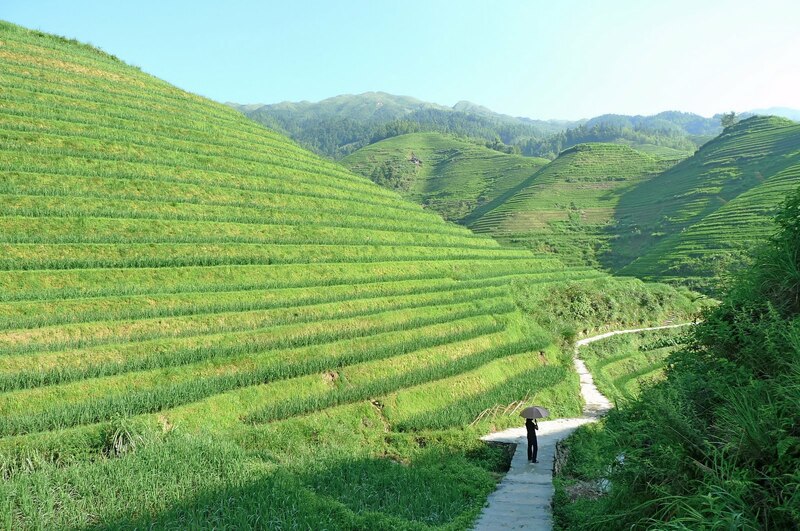 This is the Final Part of my 6-part Trip to Longji Rice Terraces. 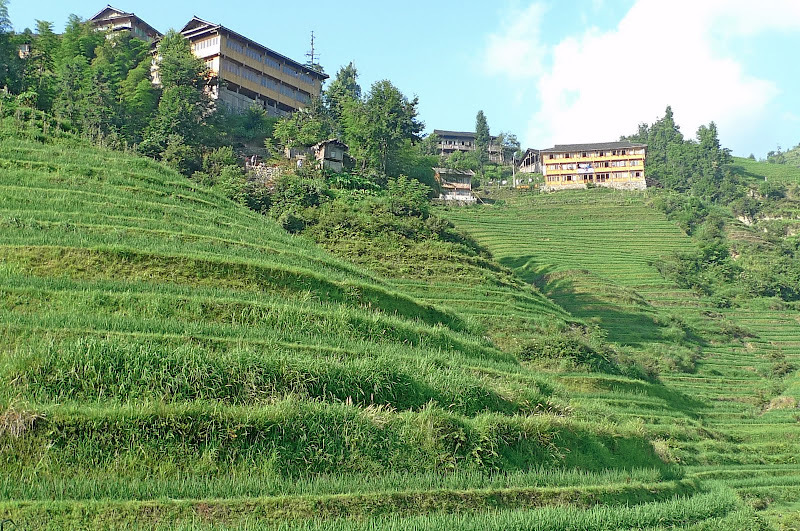 After enjoying the breathtaking views of the rice terraces from the "Home To Photographers" Hotel, we began our descend back to Dazhai where we stayed. Along the way down led by Da Jie, we continued to enjoy the scenery and took lots of photos. Most of the landscape photos here can be clicked for larger wallpaper size. Try it! I don't know about you but I just love this photo below. 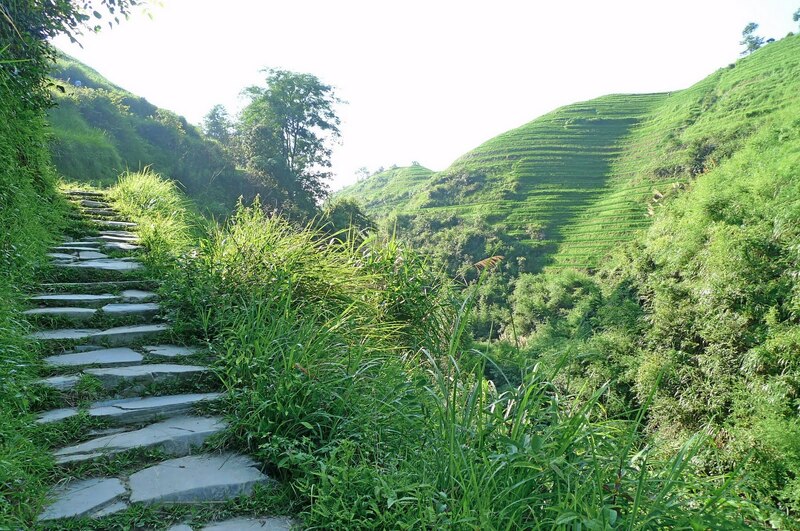 It's nice to walk on those slab stones pathway looking over the vast mountains and terraced rice fields and not knowing exactly where the path leads to. It was only about 8am when we hiked down the terraced hills. On my usual working day, I would probably be just waking up in my bed! Haha! 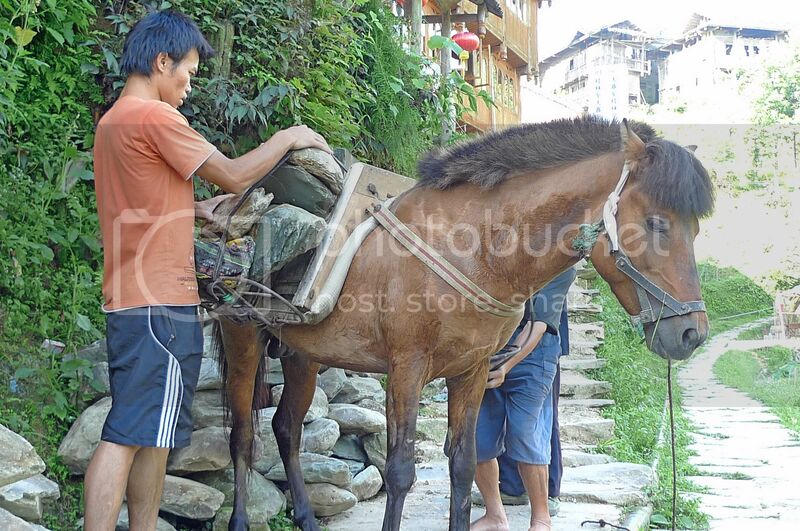 On our way down, we came across a number of horses carrying goods on their backs going uphill. Apparently, these horses were important mode of transportation for carrying goods up and down the hill. Each household here actually owns a horse! And each horse costs about 3,000 yuan. I also learnt from Da Jie that they only harvest once a year in the month of September. Each household would get about 6,000 kilograms of rice. All the rice is for self consumption and the remaining is used to feed livestock. Soon, we passed by Tiantou Village again. I remember the sky was still dark when we were at this spot on our way up earlier that morning. This is Da Jie far ahead as usual and patiently waiting for us as we took our own sweet time to snap photos of the amazingly magnificent view! 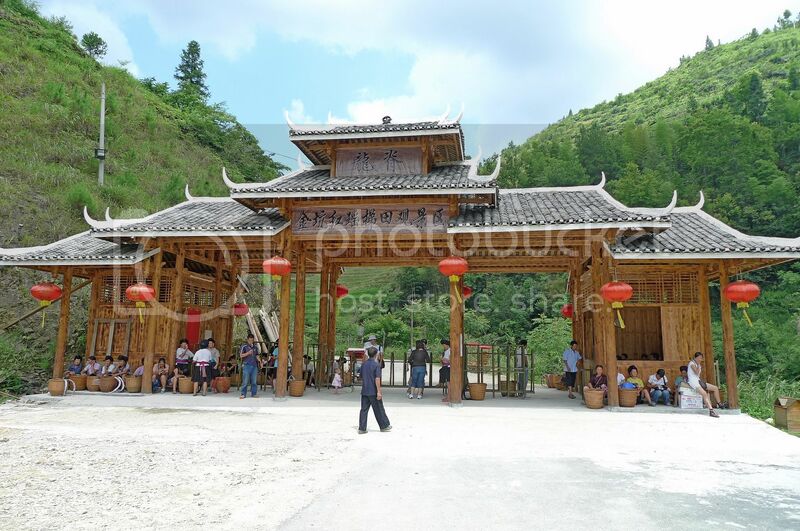 We had planned to leave Dazhai and return to Guilin at noon. But first, we had to fill our stomachs with food! So once we reached our hotel in Dazhai, we took a rest, then went up to our rooms to shower and pack before going back down to have an early lunch. 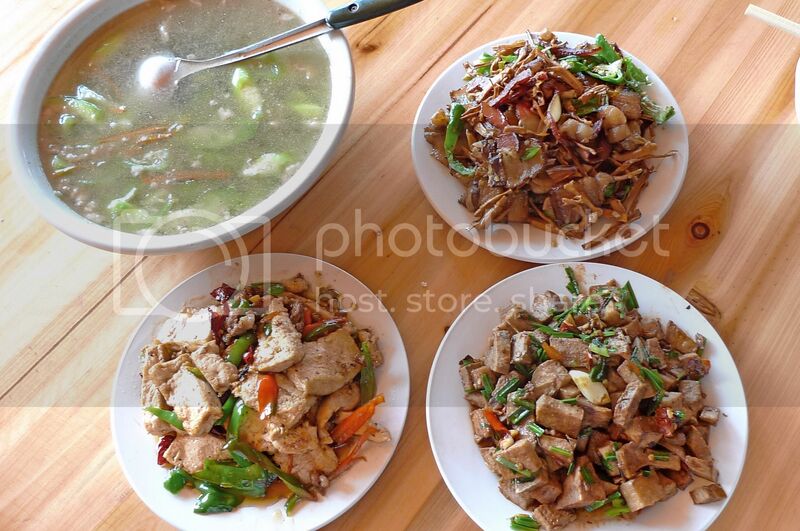 Clockwise from the top right : cured meat, yam, spicy bean curd and a bowl of soup. After the meal, Da Jie brought us out of the village and with heavy hearts, it was time to bade farewell. This had been such an enjoyable trip that now looking back at my 10 days in Guilin, I would dare say this is one of the most, if not the most interesting places to visit! One day i would like to see such beautiful places like this. Have a great weekend my friend. Pic number 3 is awesome but so are the rest, great shots! so how many more post for Guilin?? can't wait to see other topics from you in your blog leh..
i thot you're gonna use some scripting to do all your part 1 to part 10 within the same post?? hmmm, actually there are some repeated photos in every post?? haha.. seems like the photos are all the same..
you were only in Guilin for 10 days?? hmmm, i feel like you were there for one whole year.. haha!! Forgot which month you went there already. Was it July/August? Yes, i can say this is a very rare sights from Guilin.. good adventure too.. something different from the tours we have been.. The second picture and the one with Da Jie in it are awesome. 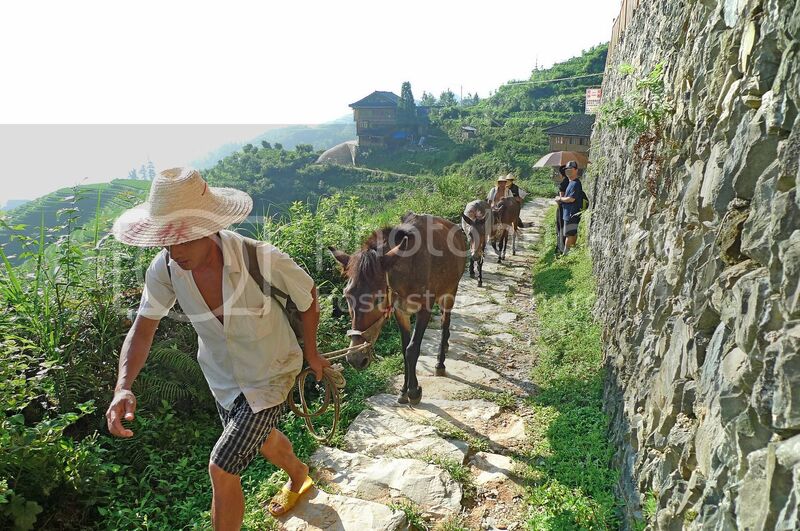 The one with the man leading the horses uphill is also very nice - like one from a travel brochure. Thumbs up! What a coincidence, Foong. 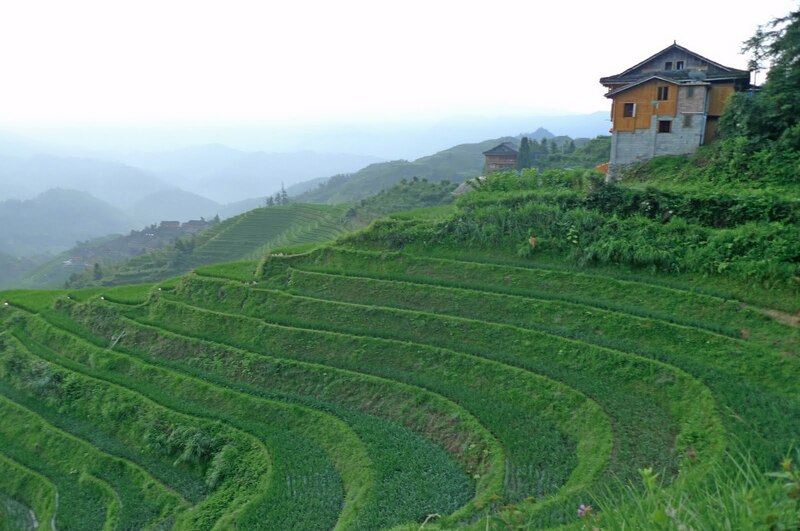 I happened upon a CCTV travelogue the other night and it was on these Longji Rice Terraces. They also showed the balcony of that hotel that belongs to the brother of your host. It was crowded with photographers waiting for the sunrise. One other amazing scene was during nightfall when the terraces were lit with lamps all over making it an awesome sight quite like stars in the night sky. Did you see that too? Btw, how much did you have to pay Da Jie for her services or did that come with the room rate? LOL on some of SK's comments but yeah lah, glad you've wrapped up on this trip or is there more to come on Guilin? Btw, have you finished with your Bali trip? Looking forward to your Cambodia and Redang holidays. Are we so far behind? hehe.. Interesting WV: quest (as though we are on a quest to conquer the world thru your travels..) LOL! Still... thanks for sharing them all, Foong. It's been pleasant trips every one, albeit virtual for us. Btw, CCTV will be covering Yangshuo next. I hope I get to catch it and match it with yours. 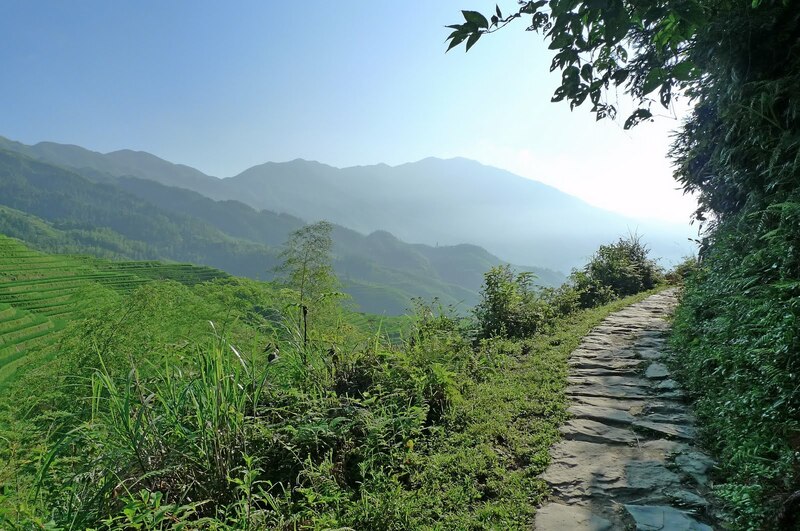 Finally it's the last post on longji! LOL! But this place is really green and has such magnificent views! Looking forward to your next post of Guilin! I don't sleep late when I travel. I like going out early to explore and travel as much as possible. 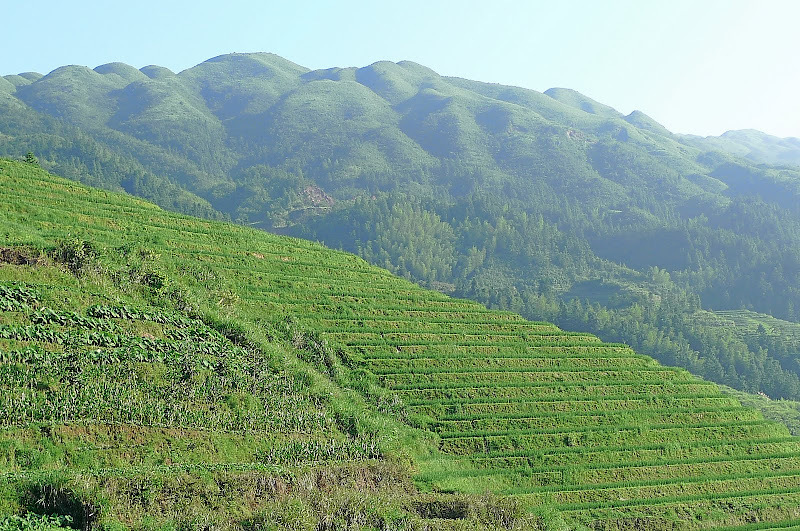 Really awesome photos from this last series of To Longji Rice Terraces. The landscape is simply breathtaking. :D How can these farmers plant their crops here? Cured meat? What's that bro? :p All the dishes looks very brown to me. omg bro, this is much better than cameron highlands! i wanna go! btw, is there any halal food there? it is taking me omos an hr to finish download yr pics n write this comment. my last try..hi! 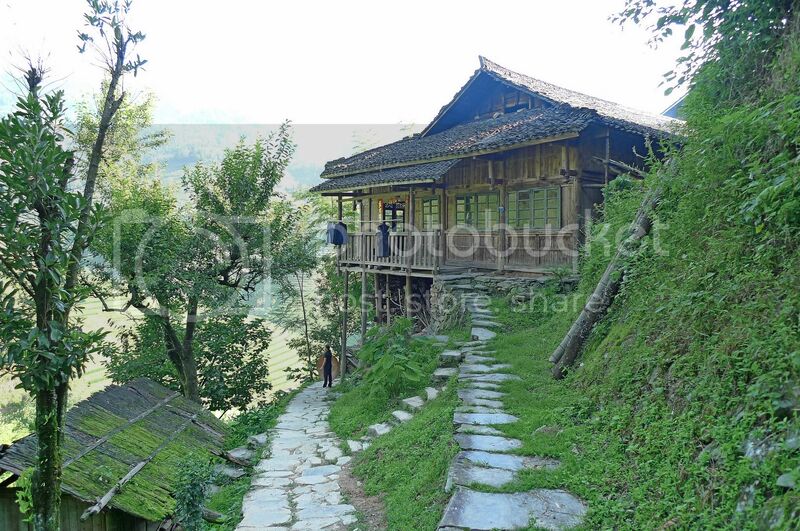 Each house costs 3000 yuan. That isn't too expensive. But of course maintenance could be high. wow, everything looks so green, my favourite kind of getaway. 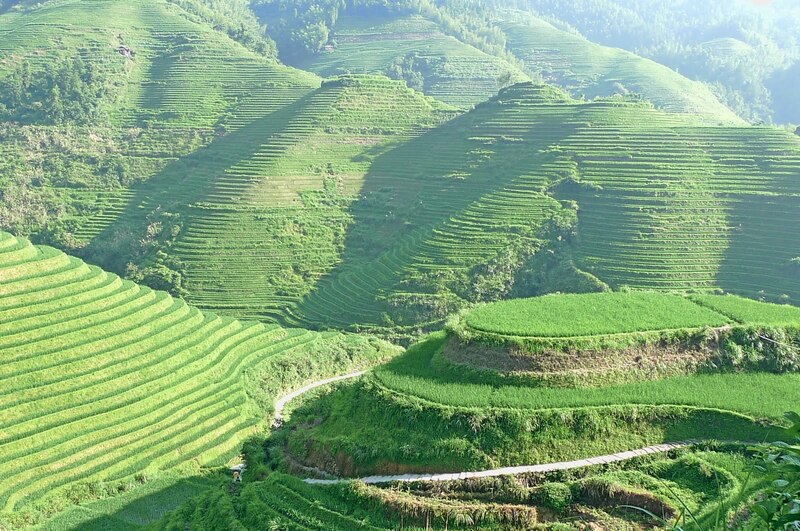 Very interesting, how they cut the hills to plant. Wow. This is the last part of your adventure? 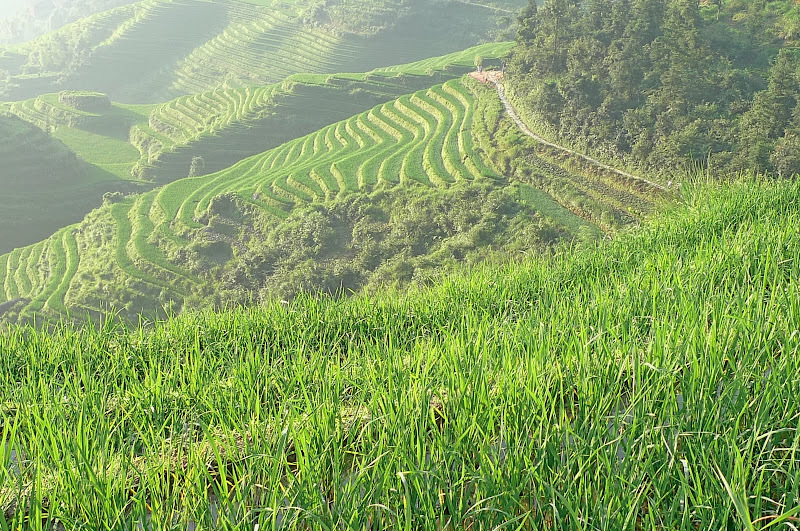 Makes me want to go to Banaue Rice Terraces here in the Philippines. Longji Rice Terrace have definitely drawn all your attention and this sequel of 6 posts is the best proof. I too liked all those posts.